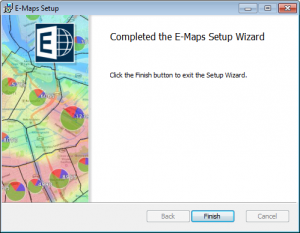 After you acquired E-Maps through the webshop or direct download, you can start installing E-Maps_2_x_x_x.exe. The file is a self-extracting installer. Click on the file and the installation will start. An installation window opens (see image on the left). The progress is shown in the setup window. 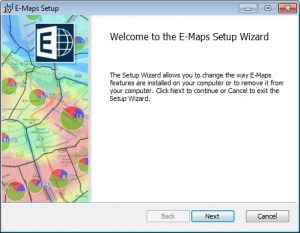 E-Maps is an Excel plug-in. Therefore Microsoft Office will ask for permission to install this adjustment. Note: read our License Agreement before downloading and using Excel E-Maps.